The Delhi Metro Rail Corporation (DMRC) has ruled out any change in the route plan of the proposed high-speed Metro line connecting Iffco Chowk in Gurgaon and IGI Airport. The DMRC has also no plans to add new stations on the line. project report (DPR) to the Haryana government, said a senior DMRC official. "We are in the last stages of finalising the DPR and hopefully submitting it to the state government in a week or two," he added. It's a serious blow to Old Gurgaon residents who have been demanding a change in the proposed alignment. "We will launch an agitation if the government fail to address our demand," said Ashok Taneja, a resident of old Gurgaon. On February 3 this year, the DMRC had submitted the project report of the 12-km long high-speed Metro route with three metro stations in between IGI Airport and Iffco Chowk to the state government. Under pressure from Old Gurgaon residents, the district officials raised some reservations to the project, saying the proposed link would serve no purpose to a large number of people living in the old city, or in the west side of the expressway. The district officials suggested some changes: Divert the proposed route from Palam Vihar towards Rajiv Chowk along Atul Kataria and Sheetla Mata roads. Old Gurgaon residents had given representations to Haryana chief minister Bhupinder Singh Hooda twice. The DMRC said the Haryana government should plan other routes to cater to the needs of Old Gurgaon residents. GURGAON: The 'Metro Lao Sangharsh Samiti' organized a discussion on Saturday to chart a concrete plan on how to bring the Metro to the densely populated old city. The meeting was organized as the samiti members realized that two main pressure groups making conflicting demands regarding the proposed Metro route can derail the entire movement. While a section of the residents have been rallying hard to put pressure on the Metro officials so that they agree to cover the old city in the proposed IFFCO Chowk -IGI airport express line, there are others who want the existing Jahangirpuri-HUDA City Centre line (line-2) to be extended to the old city. "We felt the need to jointly organize this meeting and also involve other stakeholders like market association members and other RWAs as we realized that there is some confusion prevailing over the Metro route. We want to clear the confusion, more so after some residents along with some NGOs met the Delhi Metro Rail Corporation (DMRC) chief last week along with the Gurgaon MP asking the airport express line to be extended to the old city," said Dr Ashok Taneja, an organizer. "Now we have collectively decided that we will no longer push for the airport line to be extended but would ask DMRC to extend HUDA City Centre line all the way to the old city, passing through important places like Subhash Chowk, Rajeev Chowk and Sadar Bazar. This will mean an extension of about 20-odd kilometres. The DMRC can then extend this proposed line so that it branches out to IMT Manesar on one side and towards Dwarka on the other side. We have already met the HUDA chief, MCG commissioner and the deputy commissioner and have presented this proposal. The HUDA chief is likely to call DMRC officials next week after which we will also meet the chief minister," he added. Sources in the DMRC indicated that the new route appears to be more viable. "Extending the IFFCO Chowk-IGI airport line to old city is almost impossible since the route has been finalized and there is not much scope to alter it. However, this new route that has been proposed appears more feasible. We will prepare a detailed project report in about three months. We don't foresee any problem since HUDA will provide us the land and funds to construct this line," said a source. GURGAON: For the upcoming IFFCO Chowk-IGI Airport Metro link, the Haryana Urban Development Authority (HUDA) has proposed two separate lines for better connectivity for old Gurgaon. It is proposed that one would start from Rajiv Chowk and other from IFFCO Chowk and the two would merge after Palam Vihar. The Metro officials, however, have claimed that the state government must be kept in the loop for the proposal. The Metro is expected to have over 10,000 passengers on the IFFCO Chowk-IGI Airport route. In the meeting the HUDA administrator, Praveen Kumar, pitched in for inclusion of the old Gurgaon sectors to ensure better connectivity. "I have proposed to the Metro two options: One is to have a two-line system like Delhi and the second is to take a detour passing through the old city sectors," said Kumar. He, however, claimed that no final decision on setting up two separate lines had been taken. "It will take some time, the state government has to take a final decision about the route," said Kumar. In the meeting, Metro officials said that the tentative route has a single link (from IFFCO Chowk to IGI airport) and there is no plan for a two-line system. According to the administrator, the second line should start from Rajiv Chowk and go to Sheetla Mata Mandir, Sector 5 and other sectors and then to Palam Vihar. "This line will benefit the old Gurgaon residents who use it for traveling all the way to Dwarka and other places," said Kumar. The proposed line will ease the traffic chaos in the old city roads. In the survey carried out by the Metro, IGI has 80,000 visitors every day and about 14% are from Gurgaon. ,According to conservative estimates, the detour from IFFCO Chowk before Palam Vihar will be roughly 3km. The Metro officials claimed that the decision to add one more line and a detour to the existing planned route %depended on the state %government. In the meeting the officials were not keen on any deviation in the route. Meanwhile, the old residents' committee fighting for Metro connectivity also claimed that a separate line fron Rajiv Chowk to Palam Vihar would be of great help. "This will solve the connectivity problem for all the old Gurgaon residents. At present, residents have to hire autorickshaws first to reach HUDA City Centre for taking the Metro," said Amit Arora, a committee member. The Delhi Metro says trains on this line will run at 110kmph, 5kmph faster than the Airport Express carriages. But it is to be seen if Metro lives up to its word, considering that trains on the Airport Express line have yet to hit their planned top speed of 120kmph. But not to take anything away from the good news, the Metro on Wednesday announced plans to connect Dwarka and Gurgaon, a long-felt need. Commuter traffic between the two suburbs is dense and office workers, who have to battle snarls on a daily basis, have for long been missing the Metro. More than 8,000 vehicles cross the Delhi-Gurgaon border every hour. If all goes according to plan, Dwarka and Gurgaon residents would be riding the fastest Metro by 2016. The proposed line, an extension of the Airport Express network, will connect Dwarka's Sector-21 with Iffco Chowk in Gurgaon. Sector-21 and Iffco Chowk already have Metro services. Sector-21 is served by both the blue line and the Airport Express line. Iffco Chowk is served by the Jehangirpuri-HUDA City centre line. But the Sector-21 and Iffco Chowk stations are not connected directly now. The new service will cover the distance between Dwarka and Gurgaon in 14 minutes. government, which has given an in-principle nod to the proposed project which has five stations, is considering increasing the number of stations. "We have asked Delhi Metro to work on this. If needed, we would not mind including some changes in the proposed alignment," said Parveen Kumar, administrator, Haryana Urban Development Authority (HUDA). HUDA sources said if introducing more stations in the proposed alignment means compromising with speed (105km per hour) to some extent, they would not mind that either. If the nature of operation of the line does not match with the existing airport Metro network, it will then become a separate line. One would have to change the train at Dwarka 21, said sources in Delhi Metro Rail Corporation (DMRC). According to the detailed project report (DPR) submitted to Haryana government, the travel time between Dwarka and Gurgaon would be about 14 minutes with stoppages at three stations. "This extension is highly necessary as this will provide better connectivity between Gurgaon and Dwarka, Gurgaon and New Delhi and Gurgaon with Central Delhi," said a DMRC spokesperson. According to the DPR , 14% of airport-bound traffic are from Gurgaon and roads connecting Gurgaon with Delhi cannot carry more than 8,000 vehicles. per hour per direction. The Airport Express Metro will soon become more commuter-friendly with plans to add baby changing facilities. The concessionaire company has decided to start a baby changing room at the concourse level of New Delhi and Shivaji Stadium stations. "This will be the first time in India that Metro or any mass rapid transport system will have baby changing rooms for commuters' comfort and convenience. This move will not only benefit commuters, but also transit passengers and flyers travelling with their babies," said a spokesperson of the concessionaire company. The Airport Metro is also the only Metro service in the country that provides free drinking water to its commuters. THE Haryana government plans to develop towns like Gurgaon, Faridabad, Bahadurgarh and Sonepat at par with New Delhi under its sub-regional plan of the National Capital Region (NCR). Chief Minister Bhupinder Singh Hooda announced this on Monday at the second meeting of the National Development Council (NDC) Sub-Committee on Urbanisation. “The Haryana government accords high priority to urban development and as such, the budget provision for urban sector has been increased from Rs 4,434 crore in 2010-11 to Rs 6,917 crore in 2011-12,” Hooda said. Maintaining that the Haryana government agrees with most of the recommendations of the NDC Sub-Committee on Urbanisation, Hooda said that in the formulation of the model municipal law, devolution of powers, responsibilities and functions of local governments and communities should be left to state governments, as local issues of every state and urban local bodies are different. Haryana, he said, has already prepared city development plans for 74 towns but sought the Centre’s help to cover the needs of infrastructure, which required an investment of Rs 12,346 crore. The government had already notified a PPP policy, which included the establishment of the “Haryana Infrastructure Fund” for building the required infrastructure. Hooda also stressed on the need to constitute an urban management transport authority for NCR to ensure an integrated transport system. Haryana, he said, is the first state in the country to implement a Metro project in Gurgaon through private investment. For faster and modern urban transport facilities, metros and Regional Rapid Transit Systems in NCR are being actively considered. Two priority corridors of RRTS —Delhi-Sonepat-Panipat and Delhi-Gurgaon-Alwar are capital intensive and the Haryana government had asked the Urban Development ministry to fund the same as the state was unable to do so, the chief minister said. Regarding Metro services being introduced in the NCR area of Haryana sub-region, Hooda said the work for extending Metro from Badarpur to YMCA chowk Faridabad will commence soon. Regarding the extension of Delhi Metro from Mundka (Delhi) to Bahadurgarh in Haryana, the CM said that it has already been decided that the Delhi portion of the project will be taken up in the supplementary part of Metro Phase-III. To connect New Delhi’s IGI Airport to Gurgaon IFFCO Chowk via Dwarka, a scheme of high-speed Metro Rail connectivity has been prepared with the help of the Delhi Metro Rail Corporation, he added. between Sector 21 in Dwarka and Gurgaon (Iffco Chowk). At a meeting held here on Friday, Gurgaon officials suggested to the Delhi Metro Rail Corporation (DMRC) to divert the proposed route from Palam Vihar towards Rajiv Chowk through Atul Kataria and Sheetla Mata Road. As per the existing plan, the proposed line will have three stations at Bijwasan, Palam Vihar and Maruti Suzuki factory between Iffco Chowk and Sector 21, Dwarka. The officials emphasised the need of Metro service for people living west to Gurgaon Expressway instead of connecting it directly with Iffco Chowk, where the facility is already available for residents of New Gurgaon. At the meeting, which was called to discuss the detailed project report, Huda administrator Praveen Kumar suggested a change in the proposed route. Kumar said a fresh survey should be conducted by the DMRC to ensure that the facility is made available to a large number of people instead of a handful commuters who visit the airport. “The report has to be cleared by the Haryana government. If the government suggests any change in the route, we will go by the suggested alignment,” said SD Sharma, a Delhi Metro official. The proposed high-speed Metro link will be constructed on public-private partnership. मीटिंग में कुछ सुझाव डीएमआरसी को दिए गए हैं। यह सुझाव लोगों के फायदे को ध्यान में रखकर दिए गए हैं ताकि मेट्रो का लाभ अधिक से अधिक लोगों को मिल सके। इस मेट्रो में 80 प्रतिशत हरियाणा और 20 प्रतिशत खर्च सेंट्रल को उठाना है लिहाजा हरियाणा के लोगों को इसका पूरा लाभ मिलना चाहिए। – प्रवीण कुमार , हूडा प्रशासक // i thought it was PPP?? Ministry of Urban Development. The line will have three stations — Maruti Suzuki factory, Palam Vihar near ITM University and Sector 21, Dwarka. Urban development minister Kamal Nath on Thursday announced that the government had sanctioned the Gurgaon-Dwarka Metro link. "The Delhi Metro Rail Corporation (DMRC) has submitted the detailed project report to us and we are studying it. We have, however, sanctioned the project which will be the second DMRC project in Gurgaon. We have also given the go-ahead to the Rs 1,990-crore Mundka-Bahadurgarh Metro line," Nath added. In June this year, DMRC started conducting the ground study to prepare the report for the Metro link between Guragon and Dwarka. The new line will come up on the public private partnership (PPP) model, on lines of the airport link in Delhi. Private players will be invited to bid for it. Haryana chief minister Bhupinder Singh Hooda had first announced the project to link Gurgaon with IGI airport at a meeting of the National Capital Region Planning Board (NCRPB) in November 2009, in the presence of then urban development minister Jaipal Reddy. DMRC chief E Sreedharan said, "On the request of the Haryana government, we prepared a project report for the Dwarka-Gurgaon link. It will connect the Dwarka station in Sector 21 and Iffco Chowk. The link will be an extension of the Airport Express Line which connects IGI with Rajiv Chowk station in Connaught Place." Residents of localities near Iffco Chowk such as Sector 17, 18, DLF Phase 2 and gated communities such Heritage City, Beverley Park 1 & 2, Essel Towers and those living in Palam Vihar, sectors 21, 22, 23, 23A and Udyog Vihar, from where the Metro line is likely to meander, will benefit the most once the line opens. GURGAON: All decks have finally been cleared for the operation of Rapid Metro, the city's first private Metro rail network. Haryana chief minister Bhupinder Singh Hooda and Union Urban Development minister Kamal Nath will sign a memorandum of understanding (MoU) in Delhi on Thursday. According to sources, the MoU, giving a green signal to the Rapid Metro's operation, had long been pending for clearance with the Urban Development ministry. The project was aimed at starting simultaneously with the Delhi Metro's Gurgaon line to act as a feeder line for the lakhs of commuters in the city. Though, the MoU didn't pose any hindrance in its construction activities, its operation was not possible unless the ministry signed it. The state and Centre took time in finalizing a policy for the first-of-its-kind privately built and run Metro service so that the model can be implemented in similar such projects in the future, said the sources. The project had also been sent for financial reviews and to the Law ministry for framing of rules and regulations. Meanwhile, the detailed project report for the second phase on Golf Course Road was also approved and tendering is expected to happen soon. A detailed project report for the third phase in Udyog Vihar is still awaited. Rapid Metro was an initiative of the DLF group in 2007 end. However, it later got in to an agreement with IL&FS and as on date is a silent partner in the project. Although the project planning began in 2008, it has remained stuck in one or the other "technical snags" ever since. The Centre and the Haryana government will also sign an MoU to start another Metro line from Gurgaon to Dwarka," said Union urban development minister Kamal Nath. "Phase III of the Metro has started and this would be very important in providing important infrastructure to people," Nath said. "Similarly, we are looking at expediting Phase IV as much as we can," he added. The state cabinet has given its approval to the extension of Delhi Metro from Badarpur to YMCA Chowk in Faridabad at revised cost of Rs 2,494 crore. The state will contribute Rs 1,557.40 crore within a period of 3 years. Of the total amount, infrastructure development fund will contribute Rs 778.70 crore, state government Rs 280.32 crore, HUDA Rs 311.48 crore and HSIIDC Rs 186.90 crore. A Memorandum of Understanding for development of Metro Link from Delhi Metro’s Sikanderpur Station to NH-8 in Gurgaon was signed today by the authorized representatives of Ministry of Urban Development, Government of India, Government of Haryana and Managing Director, Delhi Metro Rail Corporation Limited in the presence of Minister of Urban Development, Government of India Shri Kamal Nath and Chief Minister of Haryana Shri Bhupinder Singh Hooda. M/s Rapid Metro Rail Gurgaon with the approval of Government of India and Government of Haryana has undertaken the metro rail link of 5 km at a cost of Rs. 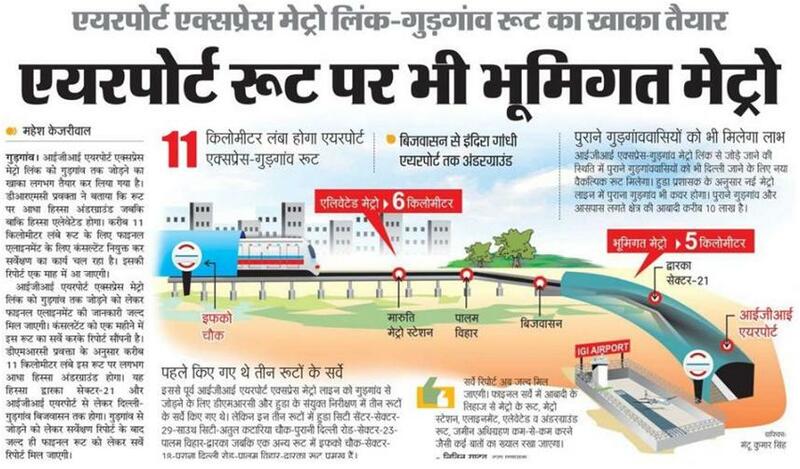 1088 crore from Delhi Metro’s Sikanderpur Metro Station to NH-8 ( Cyber City ) in Gurgaon. The designed capacity is for 2 lakh passengers a day. Commercial operation is scheduled from March 2013. This is the first private initiative in India. Metro Railway is a Central subject under the Acts. For the first time, State Government is being authorized through a MoU mechanism to enter into a concession agreement with a private party with oversight mechanism, safety and standardization kept with the Central Government. This initiative is thus an unique model on the lines of authorizing State Govts to enter into concession agreement for National Highways by National Highway Authority of India (NHAI).The concession agreement with the private party is for a lease period of 99 years. In the event of failure of the private party to commission or operate the system in future, the project would be taken over by the DMRC for implementation. India is urbanizing rapidly. The urban population has increased from 285 million in 2001 to 400 million in 2011. India’s young age profile makes Indians ‘more mobile’, thereby adding further momentum to urbanization. To achieve the vision of creation of economically vibrant, inclusive, efficient and sustainable urban habitats, provision of safe, quick, reliable, comfortable, affordable and environment friendly urban public transport is of paramount importance. Among the various modes of public transport, Metro Rail is being given high priority by the Government of India. New Delhi A high-speed Metro line connecting the IGI Airport to IFFCO Chowk in Gurgaon has been proposed as the most suitable link by the Delhi Metro in its final detailed project report that is slated to be submitted to the Haryana government on Friday. Since the line is suggested to be an extension of the existing Airport Metro Express Line, DMRC has proposed that Reliance Infrastructure, the concessionaire operating the line, be roped in for the extension. Delhi Metro had written to Reliance Infrastructure earlier this week, asking if they would be interested in operating this line too, to which the concessionaire has now formally expressed interest, sources in DMRC said. Director (Works) at DMRC Mangu Singh confirmed that Reliance Infrastructure has expressed interest in the project and that the concessionaire will be named as the first choice to operate the line. “While this will be mentioned in the detailed project report, it is finally up to the Haryana government to decide. The final DPR will be submitted in a day or two,” Singh told Newsline. Since the corridor is proposed for implementation on the lines of the Airport Metro, the civil construction is most likely to be carried out by DMRC or by the Haryana government while the operations and maintenance are proposed to be given out to the concessionaire for a stipulated concession period. The DPR proposes a 10-km direct link from Dwarka Sector-21 to IFFCO Chowk with two stops in between. While the entire corridor will be elevated, about 1.5 km of the corridor will be underground, as it runs out of the existing Dwarka Sector-21 station of the Airport Express line. The corridor is proposed to have stations at Palam Vihar and Maruti Udyog before it terminates at IFFCO Chowk, where it will be integrated with an existing Metro station for seamless travel. Officials said Palam Vihar, with a significant residential population, and Maruti Udyog being an important industrial centre, were considered as suitable stops. Provision for yet another stop on the route will be made, which can be developed later if needed. The line is expected to reduce travel time for commuters from Gurgaon to Delhi — approximately 30 minutes to reach Shivaji Stadium. Regular commuters from Gurgaon can also interchange at Dwarka Sector 21 and take connecting Metros to other parts of the city. Sources said the traffic surveys revealed the need for a high-speed link on this route and showed that a significant part of the road traffic from Gurgaon to Delhi will be taken off if this corridor comes up. The survey, however, does not determine whether most of the traffic on this line will be airport-bound or general commuters travelling between Gurgaon and Delhi. Earlier, Delhi Metro was also looking at HUDA City Center as another option for the terminating point, but according to the traffic and other feasibility studies IFFCO Chowk came up as a more suitable option. NEW DELHI: The NCR concept just got a shot in the arm. In a bid to connect the various parts of Delhi with the neighboring areas of Bahadurgarh, Noida, Gurgaon as well as Faridabad, the Delhi Metro will be going further inside these NCR areas in the third phase of its network. While the detailed project reports (DPR) for the extensions to Gurgaon, Faridabad and Bahadurgarh is ready and have been sent to the ministry of urban development for approval, the alignment for extension to Noida's sector 62 is still under finalization. Work on all the connecting extensions to the NCR areas is expected to be undertaken by 2012, to be part of the Delhi Metro's phase III construction. With these alignments, the Delhi Metro will be blurring the state lines further and underlining the NCR concept, say officials. Said a spokesperson from the Delhi Metro Rail Corporation, "The empowered group of ministers (EGoM) has directed that the lines (connecting the NCR) may be considered for inclusion in Delhi Metro Phase III and a separate proposal be brought for consideration of the EGoM. We are in the process of finalizing all the alignments at present." The alignments include the extension of the existing Mundka corridor (Mundka-Inderlok) to Bahadurgarh, crossing the Tikri Border via Ghevra. The other line extension is that of the Yamuna Bank corridor to Noida's sector 62 via sector 32. This corridor at present is till Noida City Center. Another line extension – of the new Mukundpur-Yamuna Vihar corridor of Phase III on to Shiv Vihar, an expansion by 3km, will also bring the outskirts of Delhi into closer contact with the central parts. That's not all. As reported by TOI earlier, the extension of the Dwarka sector 21-Noida City Center line to IFFCO Chowk via Palam Vihar along with the extension of the Badarpur corridor to YMCA Chowk in Faridabad is also on the cards. This is besides the new corridor from Dwarka to Najafgarh, stretching over 13.875km, which has been sent to the ministry of urban development already for approval. Sources in Delhi Metro said that these alignments had been also clubbed with the three new extensions – Bahadurgarh, Noida sector 62 and Shiv Vihar, as a separate proposal for EGoM approval. "The proposal is for inclusion in the Delhi Metro Phase III, which means that work will need to be started by 2012. The DPRs of all these alignments have been put on fast-track," said the Delhi Metro official. NEW DELHI: Delhi Metro is making further inroads into Gurgaon, with the line from Dwarka Sector 21 set to extend some 12km, connecting to IFFCO Chowk. The alignment has been finalized and the new Gurgaon corridor will have two stops – at Sector 18 and Sector 23. "The approval for the alignment of the new link has come through. The final approval should also be given soon. Completion of the link is expected by 2016," said a Delhi href="http://timesofindia.indiatimes.com/topic/Metro-Rail-Corporation">Metro Rail Corporation spokesperson. It is not decided yet if the extension will be through the Airport Express line or the Blue line (Dwarka Sector 21-Noida /Vaishali). The detailed project report and the environment impact assessment study for extending the Metro from Dwarka Sector 21 to Gurgaon is to be undertaken soon. "Whether it will be a high-speed corridor like the Airport Express Metro or a regular one like the Blue line depends on the funding from the Haryana government," said a source. The link will make travel from Dwarka to Gurgaon a matter of 12-14 minutes , irrespective of the type of corridor to come up , said Delhi Metro officials . The link – the second to enter Gurgaon – will notonly help bring the Millennium City closer to central and west Delhi, it will also take a large chunk of the crowd from the crowded Yellow line or line 2 (HUDA City Centre-J ahangirpuri ), which carries more than six lakh passengers every day . The link will also provide connectivity to line 2 and the Blue line or line 3 (Dwarka-Noida /Vaishali ) at Dwarka sector 21 station. The new link is expected to cut down travel time drastically by as much as half hour for those travelling from Gurgaon to Delhi, from the circuitous route they now take to the Dwarka line. The halts proposed are Palam Vihar Station (Sector 18), and Maruti Udyog Station (Sector 23 ). The new link will be the second Metro corridor to enter Gurgaon . The existing Line 2 (HUDA City Centre-J ahangirpuri ) already carries more than six lakh passengers everyday on the line . Sources said that work on the new link is expected to take off as soon as government approval is given . "Talks over the funding pattern are already underway . Once the Haryana government decides on the mode of funding , work will be started ," said the source . While the Airport Express Metro was a PPP model , with Reliance Infrastructure being the concessionaire , tender for the Gurgaon link will be taken out separately , added officials. The Delhi Metro in its final detailed project report for a direct link from the Indira Gandhi International Airport to Gurgaon has proposed an extension of the existing high speed Airport Metro line to HUDA City Center. A 12-km elevated corridor linking Gurgaon to the heart of the Capital via IGI Airport, in just 30 minutes, is being proposed as the most suitable link. The report, slated to be submitted to the Haryana government next week, proposes a direct link from Dwarka Sector-21 to HUDA City Center with two stops in between. While the entire corridor will be elevated, about 1.5-km of the corridor will be underground near the existing Dwarka Sector-21 station. The corridor is proposed to have stations at Palam Vihar and Maruti Udyog and will terminate at HUDA City Center, where it will be integrated with the existing Metro station for seamless travel. Officials said Palam Vihar with a significant residential population and Maruti Udyog being an important industrial centre were considered as suitable stops. Provision for yet another stop on the route will be made, which can be developed later if needed. The line is expected to reduce travel time for commuters from Gurgaon to Delhi, taking just 30 minutes to reach Shivaji Stadium from HUDA City Center. Regular commuters from Gurgaon can also interchange at Dwarka Sector-21 and take connecting Metros to other parts of the city. According to traffic surveys, a significant number of commuters will switch to the Metro and traffic will lessen on roads once this corridor comes up. “The survey, however, does not determine whether most of the traffic on this line will be airport bound or general commuters travelling between Gurgaon and Delhi. But traffic figures show a substantial passenger load if the line gets operational,” said a senior Delhi Metro official. However, the feasibility and detailed project report also looks at two other options for a regular Metro corridor with terminating points at HUDA City Centre and IFFCO Chowk. The HUDA City Centre route is likely to run through South City Chowk, Atul Kataria Chowk, Old Delhi Road, Sector-23, Palam Vihar and Dwarka Sector-22. The other possible route is expected to run from IFFCO Chowk, covering Sector-18, Old Delhi Road, Palam Vihar and Dwarka Sector-21. The Delhi Metro, however, has recommended the extension of the high speed Airport Metro corridor as the most suitable link. If the high speed link is chosen over the other two regular corridors, it will have to be implemented on a public private partnership as the costs involved will be high. Sources said that Reliance Infrastructure that operates the Airport Metro link has already expressed interest in the project. Once the proposal is approved by the Haryana government, negotiations with the concessionaire will begin. Come 2013, the swanky high speed airport express line metro will cross the boundaries of Delhi and reach Millennium City Gurgaon. Once this extended corridor is in place, you can travel between New Delhi and IFFCO Chowk in Gurgaon in just 25 minutes. Reliance Infrastructure (R Infra), the concessionaire company of the 22.7 km airport expressline, said if invited to take up the project it would complete it in two years at a cost of Rs 800 to Rs 1,000 crore, said sources. The company, which had initiated talks with the Delhi Metro Rail Corporation (DMRC) in February 2011, is quite assertive about being awarded the project. HT had reported about the news in its February 6 edition, in which DMRC chief E Sreedharan had said DMRC was very happy about the success of the PPP model explored with Reliance Infrastructure and indicated that project would possibly be awarded to the company. On Tuesday, Sreedharan said, "The extension of the expressline up to Gurgaon has been incorporated in phase 3, and it would be awarded to Reliance Infrastructure only if the company agrees to take it up on the existing terms and conditions". Later, talking to HT R Infra's CEO and director Lalit Jalan said: "We are ready to take up the project and are just waiting for a formal communication from the DMRC." He said the concessionaire company has already done initial techno-commercial study and would conduct a deep study and come out with the concrete plan, immediately after getting the assignment from DMRC. Three tentative routes for this have already been worked out but the exact route will be finalised after DMRC completes the feasibility study of the project. Possibly the new line will go through Palam Vihar colony, said sources. They added the new corridor, about 11 km long, will have both underground and elevated stretches with two stations. However, the exact locations of stations are yet to be decided by DMRC. Jalan said that extension of the line would mostly cater to the residents of Gurgaon ‘both airport-bound and general commuters' as there is hardly any means of transportation of this standard available for them. GURGAON: The IFFCO Chowk-IGI Airport Metro link has hit stumbling blocks in Gurgaon, which could significantly reduce the speed of Metro on the proposed express line. While the initially planned speed of trains on this route was 100km per hour, the actual speed might get reduced to 70km per hour due to structural obstructions on the route. These are the findings of the DMRC team which had surveyed the possible routes in Gurgaon. According to the tentative plan, Metro will connect IFCCO Chowk to Dwarka Sector 21 and then it would be further linked to the IGI Airport. The state government came up with the idea of the new link on the lines of the much hyped Airport Express Line, which directly connects New Delhi to the airport. The DMRC team has zeroed in on two probable routes for the proposed Metro link. But sources said that both these routes have obstructions like multi-storey buildings on the way, which would result in steep turns on the elevated track. The speed of the train at such turns will have to be reduced, subsequently cutting down the average speed. "On the first route, there are two obstructions. This pushed us to study the second route which has one obstruction. The DMRC experts are still working out the possible impact of the angular stretch on the speed of the train," said a source close to the development. However, the single turn on the second possible route is said to be so sharp that the average speed can not go beyond 70 KM per hour. According to experts, the turn of a radius for elevated alignment should be 1,000 metres. But in the case of these obstructions, the turn of radius could be more. The DMRC team visited the colonies that fall on the proposed routes. Apart from the haphazard constructions, the DMRC team also visited railway lines near Palam Vihar colony in Gurgaon which could be a problem area. "The final decision of the route will be decided on basis of the route which allows higher speed on the elevated track," said a DMRC official. The final planning of the route will be presented to the HUDA and city authorities in two months time. NEW DELHI: After burning its finger with the PPP (public private partnership) model on the Airport Express Metro line, the Delhi Metro Rail Corporation (DMRC) looks prepared to take another chance on the model. In its ongoing feasibility study on the extension of the Metro line from Dwarka to Gurgaon, the DMRC has suggested inviting private participation in the project. Interestingly, DMRC chief E Sreedharan has been vocal about his reservations on the PPP model, citing the Airport Express Metro line which missed its deadline and got delayed by several months, a fact that prompted Sreedharan to say that DMRC was "not used" to such delays. Now though, the Metro seems to have changed its thinking, suggesting the participation of private companies in the Gurgaon project. Said Mangu Singh, director (works), DMRC, "There are three main models being suggested for the project, including the PPP model." The study, which has been commissioned by the Haryana government, looks at funding model, timeline, implementation and construction of the Metro from sector 21 Dwarka to Gurgaon. The three models, according to Singh, are: getting an outside company to take up the project on the PPP model; getting DAMEPL (the Airport Express Metro line concessionaire) to extend the Airport line on a competitive rate to Gurgaon; and constructing the line themselves. Added Singh, "The ultimate decision will be taken in consultation with the stakeholders but based on the study, these three options have been given." The study, incidentally, will be submitted in another two months, with the DMRC still to decide on the stations and other factors for the line. The study is also going to take into account the fare structure, which will have to mirror the rest of the Metro network, said officials. "If the Airport Express line is extended, the fare would have to be restructured," admitted the official. DMRC is also looking at turning the Dwarka sector 21 station into an interchanging one for the line extension, added officials. The construction of the line will take around three to four years, say DMRC officials, after the Haryana government takes a decision on when to start. Funding, says DMRC, will be by the Haryana government. Interestingly, the line, when constructed, will be the first direct connect by non-surface transport between Dwarka and Gurgaon, which is connected through the toll road at present. The line will be both elevated and underground, said Singh. "Whatever model is followed, the basic design will be given by us for the line, which will include both elevated and underground sections on the metro alignment." 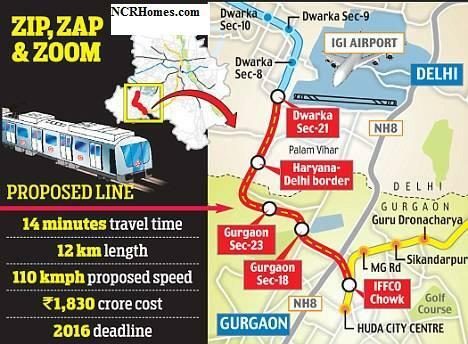 New Delhi: Upscale Gurgaon will become the first town falling under the National Capital Region to get connected with Delhi's Indira Gandhi International Airport (IGI) through a high-speed metro railway link. The Delhi Metro Rail Corporation (DMRC) has started surveying possible routes and stations to connect Gurgaon's HUDA City Centre metro station with the airport. Once the project is completed, the airport will be reachable from Gurgaon in less than 15 minutes. Gurgaon is home to a large number of multi-national corporations and call centres catering to the western world. Although it is connected with Delhi by two roads, including an expressway, and the metro connects HUDA City Centre with the Central Secretariat through South Delhi, commuting to the airport through the congested expressway, particularly during peak traffic hours is a big problem. The proposed link will come as a boon for those living or working in the Har yana town situated south-west of the national capital. "The HUDA (Haryana Urban Development Authority) will forward the report to the state government for approval," HUDA administrator Nitin Kumar Yadav said, adding that upon approval, work can start without much loss of time. A high-speed metro link between New Delhi Railway Station and the Indira Gandhi International Airport which missed the October Commonwealth Games deadline is ready to be inaugurated next month. The proposed Gurgaon-IGI link would be connected to this corridor at Dwarka Sector 21 metro station instead of going directly to the newly constructed Terminal 3 of the IGI due to security concerns. It would mean those headed for airport from Gurgaon would have to change trains at Dwarka Sector 21. The proposed metro link will have very few stations and run through Old Gurgaon before reaching Dwarka. Trains on this proposed 15 km elevated route are expected to run at 100 km per hour. Delhi Metro is already connected with Noida in Uttar Pradesh and Gurgaon in Haryana. Vaishali township of Uttar Pradesh and Faridabad in Haryana will be connected with Delhi in the next phase of expansion which has already started. Gurgaon, however, will become the only NCR township to have two metro links. A 6.1 km link is under construction from Gurgaon's Cyber City to the Delhi Metro. GURGAON: At a high-level meeting held in Gurgaon on Tuesday, officials from DMRC and different city authorities discussed three possible routes for the Iffco Chowk-IGI Airport Metro link. The joint team also inspected different sites located on the possible routes, which will be mostly elevated. Sources said that three tentative routes have been worked out but the exact route will be finalized after the DMRC completes its feasibility study of the project. They added that the team of officials inspected several colonies which are located between Gurgaon and IGI Airport. Senior HUDA official said that the DMRC officials visited residential colonies in Palam Vihar and other nearby areas during the day-long inspection. The Metro officials told HUDA officials that their main priority is to see that no high-rise comes in the Metro line alignment. They surveyed the localities, inspected the roads specifications thoroughly to chalk out tentative routes for the elevated Metro track. The team also visited the railway tracks near the Palam Vihar colony, said one of them. The DMRC has already prepared a detailed project report and its experts are now whetting the final aspect of the project which will include the project cost calculation and technical reports. Sources said that the issue of alignment of the elevated track is more crucial for maintaining high speed of the trains on elevated tracks. Apart from route, the DMRC has yet to finalize other operational aspect of the project including the number of trains, the yard, and strategy to sync the Gurgaon-Delhi route with Gurgaon-IGI route. The proposed IGI express link will be similar to the Delhi-IGI link in all aspects such as looks of Metro trains, coaches, speed and passenger capacity. The spadework for the metro link had started full steam when the chief minister, Bhupinder Singh Hooda during his recent visit instructed city authorities to speed up the projects planning. GURGAON: The Haryana government has decided to link Gurgaon with the Indira Gandhi International Airport through metro rail. The DMRC has been requested to prepare a detailed project report in this regard, said chief minister Bhupinder Singh Hooda. Metro rail service has already started between Delhi and Gurgaon and now it will be extended to Manesar, he said after inaugurating a high-tech media centre at the Congress Office here. Hooda said his government is contemplating to ply pod taxis in Gurgaon. "If pod taxis are successful in Gurgaon, these will be run in other cities also." NEW DELHI: Haryana's claim to extend the Metro services to Manesar appear to be far-fetched with DMRC chairman E Sreedharan denying expansion of the modern urban rail service beyond Gurgaon's HUDA City Centre in the immediate future. "While earlier, the state government had talked about extending the existing line to Manesar, right now there is no such demand. We have not been approached for this expansion," the Metro chief told TOI during an exclusive interaction on Tuesday. Only three days before, Haryana chief minister Bhupinder Singh Hooda had told reporters in Gurgaon that his government was working to expand Metro's reach to the industrial township. However, on IFFCO Chowk-IGI Express Link, Sreedharan said that a feasibility study was being conducted. "We have agreed to execute the project. This proposed line will reduce the travel time between Gurgaon and IGI to only 10 minutes. This stretch will be largelyelevated," he said. Sources in Haryana government said that next week city authorities will hold a meeting to discuss the land acquisition for this ambitious project. The airport express link is likely to be financial viable,considering the increasing number of frequent fliers in Gurgaon and the manner in which hotel industry has grown here. In the span of next five years, two more satellite towns of Haryana -Faridabad and Bahadurgarh -are likely to get Metro connectivity. "Recently, I met the chief minister in Delhi ," said Sreedharan, while adding that DMRC was all set to begin work on Faridabad line. "But we need to get the written clearance from Haryana government on this. He (Hooda) has assured me to get the letter within one month." Once the state government gives necessary clearances, Metro engineers estimate to complete work on this stretch within a period of three years. GURGAON: In a bid to expedite the ambitious project to link Gurgaon with the IGI airport through the Gurgaon-IGI airport metro link, the top brass of DMRC is all set to meet HUDA officials next week. A senior HUDA official said: "The meeting is crucial for the project, which is now the top priority of the government. In the meeting, the possible route of the new link and a feasibility study on the same will be taken up for discussion." A detailed project report has already been prepared in this regard and the project had been whetted by DMRC last month. The project is called IFFCO chowk airport express and the possible route has been planned out already. "The feasibility study will explore all other possibilities of the route. At present, the tentative route has IFFCO Chowk, Palam Vihar, Sector 21 and the IGI airport," said another senior government official. The route will follow the same track till IFFCO Chowk, following which it would branch off to elevated tracks. The starting of the Delhi-Gurgaon link has improved connectivity, but the new project (Gurgaon-IGI link) will change the way the city flyers travel to the IGI airport. In the operational aspect, the authorities are making it as a replica of the Delhi-IGI metro link. The travel time both from Gurgaon and Delhi will take almost the same time. The residents, meanwhile, are a happy lot. "The metro connectivity between Gurgaon and the IGI airport will certainly make the city truly millennium. The metro link will boost investment not just to Gurgaon but also to Manesar," said a senior executive of a real estate company. Haryana Chief Minister Bhupinder Singh Hooda has asked Delhi Metro chief E Sreedharan to connect Indira Gandhi International Airport to Sector 29 in Gurgaon via Metro rail. During a meeting held on Tuesday, the two discussed several Metro extensions between Delhi and Haryana, including links to Bahadurgarh, Sonepat and Faridabad. Though these projects were announced earlier this year, there has been little movement on any of them due to pending government approvals and funding issues. During the meeting, the projects were discussed afresh and officials said Sreedharan showed keen interest them. “Sreedharan said DMRC is ready to offer all co-operation for these projects,” the statement said. In August, Hooda approved the state government’s share of Rs 15.88 billion for the Metro link to Faridabad. The project, however, is stuck reportedly due to pending approvals from the Central government. The Metro link to Faridabad is planned to be 13.875-km long, with nine stations connecting Badarpur border to YMCA crossing (chowk) in Faridabad. After the success of Central Secretariat to HUDA City Centre Metro link, the Haryana government has been keen on further Metro extensions in the state. While, the Delhi Metro has been discussing these projects, it is yet to begin work on them. Delhi Metro’s new helpline number, which will be operational from January 1, will be 155370 instead of 155363, as announced earlier. Metro officials said due to unavoidable circumstances the Department of Telecommunications had to change DMRC’s newly allotted telephone number. “The new helpline will provide better and improved connectivity from GSM and CDMA mobile phones. It will replace the existing number 128128 from January 1,” said a DMRC spokesperson. Officials said calls made on this service are not toll free.